This is what the mural looked like after one firing. It’s mostly just background colors, and establishing shapes of things. When I need to put a solid color behind a complex shape, for instance, the sky behind the tree, I save that for the next firing. This is one of the smaller pieces I’ve done lately, only 6 6” x 6” tiles, but it will make a charming accent in a shower. This piece got installed recently. It’s based on some art work my client sent me. I posted a picture of these tiles back in November of 2017 right after they were finished and laying on the table in my studio. They finally got installed, the room finally got finished, and I finally got up to the island to shoot them. 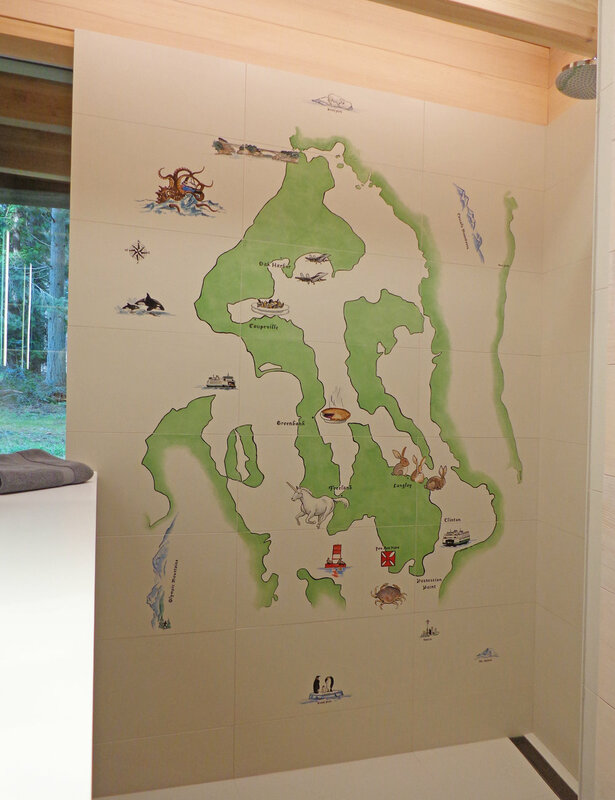 This is a fanciful map of Whidbey Island, with local attractions, some of which you’d have to live there to get. My favorite is the Kraken eating the Victoria Clipper boat. It also features the North Pole up by the ceiling, the South Pole near the floor, New York and Florida off to the right, and the Olympic Mountains, complete with Susquatch, on the left. Clients like this don’t come along very often.